With the free version, you can create an unlimited number of MIDI tracks, and two one-minute audio tracks. With the $19 optional Multi-Audio accessory, you can record and real-time mix up to 8 sixty-minute audio tracks. Anvil Studio is a multi-track program for recording, composing, editing, and mixing of music using MIDI, digital audio, and sampled percussions. The free version now hosts VST-Instruments. The free version lets you record an unlimited number of MIDI tracks and one Audio track. With the Multi-Track accessory ($19), you can record multiple Audio tracks. Audio effects include delay, pitch change, volume change, filtering, and reverse. Designed to work with optional accessories such as sheet music printing, piano exercises, ear training exercises, and voice-pitch analysis. Bugfix for problems with the display of enharmonic notes. Improved VST compatibility, including Antares Audio Technologies. Free version supports a single VST-Effect or VST-Instrument. Pro-Mix accessory supports an unlimited number. Fix for problem where if VU was pressed before recording of an audio track started, it would not capture the start of recording. Fix for other minor problems. Better File / Export Mixed Audio. Supports importing and exporting .ogg audio files as well as any audio file format that you have a DirectShow or ACM Codec installed. Fixed issue where the Rewind button sometimes caused extra spaces to be drawn on the staff. Bugfix for Edit / Paste Special problem where it was sometimes pasting lyrics for one note beyond the last note in the clipboard. Bugfix for problem where View / Upgrade was saying version3.htm was in use by another process. Can now print custom fonts, e.g. 13/16, with the correct font. Improved DirectX mode when VST-Instruments are loaded. Bugfix for a problem that prevented selecting both clefs when lyrics were hidden. Enhanced the Staff editor's Chord Builder tool. Bugfix for File / Repair Song deletes redundant, unnecessary events. Bugfix for File / Save deletes all EndOfTracks except the last one. Several minor improvements to the staff editor. Bugfix for File / Export Mixed Audio sometimes generated distortion when set to ASIO mode. Bugfix for View / Lyrics menu would sometimes not cause lyrics to be visible. Piano Roll Editor now has splitter bars and scroll bars. Staff editor now has Chord Builder . The free version now hosts VST-Instruments, allowing limitless sounds. You no longer need to rely on the high-latency, Microsoft GS Wavetable Synthesizer. Posted by Anonymous on Sat, 04/02/2016 - 23:06.
this is said to be easy? always 5000 items to view, read, options to the moon, nothing easy about it. Q: Anvil Studio run as a VSTi? Posted by dabug3 on Thu, 02/07/2013 - 07:03. Posted by Anonymous on Sun, 07/06/2014 - 00:08. Posted by Mr. W on Wed, 01/02/2013 - 01:35. Why won't Anvil Studio let me set a midi event at the beginning of a measure? Whenever I try, it always goes to the millisecond before it (example: measure begins at 0:12:00, but midi event is instead set at 0:11:29)! Posted by Mr. W on Wed, 01/02/2013 - 01:38. Just to clarify, it happens with practically every song I open. Posted by eighty7 on Fri, 11/18/2011 - 23:26.
is there any other software that is very similar to this? i'm just curious. Posted by Omega 3 on Fri, 12/09/2011 - 22:41. I tried looking up software like Anvil but could find none. So, no. Everyone who uses the latest version of Anvil Studio, READ THIS! Posted by Omega 3 on Fri, 11/18/2011 - 00:15. Okay, one of my midis got turn into a complete piece of $&]; because of Anvil Studio (it was so lucky I had backups). The notes started to play off-key and the song now sounds disgusting. (I DID NOT MAKE THIS MIDI! SOMEONE ELSE DID! NO COPYRIGHT INTENDED!) This may sound familiar to you. You tell me if you hear a difference(and if the links die). Posted by Willow Software on Fri, 11/18/2011 - 01:05. I've downloaded both files and will begin to examine them. Posted by Willow Software on Fri, 11/18/2011 - 16:07. Sorry but I could not hear the difference. Both songs are 1 minute 9 seconds long, nearly identical file sizes. Looking at the event list, I saw only superficial differences (e.g. we store the version of Anvil Studio the file was saved with - 2009.11.03 vs 2011.11.06). Maybe my ear isn't sensitive enough, but if you could let me know how many seconds into the song the two files diverge, I'd appreciate it. Posted by Omega 3 on Fri, 11/18/2011 - 23:36. Precisely 6 seconds into the ruined song, there is a hard-to-hear trombone that is supposed to play a low F. Instead, it plays something else that has absolutely NO relation to the song. 6 seconds later, on the same track, it changes to a rock organ and plays 9 note counts lower than it's supposed to. Any other notes in that one track play off-key. Posted by Willow Software on Sat, 11/19/2011 - 21:30. I cannot thank you enough Omega3 for your help in uncovering this bug. It is fixed in version 2011.11.08 which we will release after our testing cycle. It occurred when a track had several Program Change events past time 0. Posted by Omega 3 on Sun, 11/20/2011 - 00:58. Posted by Willow Software on Sun, 11/20/2011 - 21:37. Posted by Omega 3 on Sun, 11/20/2011 - 22:59. Posted by CARCRASHER on Tue, 10/25/2011 - 20:34.
when i play midis, there's a lag and it doesn't play for 5 seconds. Then it sounds all distorted. when i push stop, it says "Anvil Studio was unable to play this song in perfect sync." what the heck does this mean?! Posted by Willow Software on Fri, 11/18/2011 - 16:11. This should never happen, even for a song with a huge number of tracks, notes, and controller events. If you could please email the song file to us at support@AnvilStudio.com we will get to the bottom of it and get back to you with a resolution. Posted by CARCRASHER on Fri, 11/18/2011 - 23:41.
i know for sure that it is not the song file. i've tried other midis and i got the same error in the same situation. some weren't even as large. what's the problem then? could it be my computer? Posted by Willow Software on Sat, 11/19/2011 - 21:33. I realize there is nothing wrong with the MIDI file. The reason we'd love for you to email us or post the MIDI file is because different MIDI files have different combinations of events, and if this one is demonstrating a bug in the software, we would really love to fix it. Posted by CARCRASHER on Sun, 11/20/2011 - 01:00.
i uninstalled the program and installed it again. it works fine now. Posted by CARCRASHER on Sat, 11/19/2011 - 20:43.
more or less, its the software. Posted by C quincr on Thu, 10/27/2011 - 22:45.
it could be that your song has too many notes, or your computer is already doing too much. Posted by Jason on Tue, 07/19/2011 - 04:17. Just to clarify the status of Anvil Studio - it is only free as a MIDI Editor/Sequencer, you have to buy the software to get the multitrack audio recording features added to it. Posted by The third gender on Fri, 07/15/2011 - 19:10. I am thinking of converting on of my .wav files into a .mid. Is this possible with Anvil Studio? If it is, how do I do it? Posted by AnvilStudio on Mon, 09/19/2011 - 19:05. Anvil Studio can convert a .MID file to a .WAV file, but not .WAV to .MID. Just to clarify, the free 2011 version of Anvil Studio allows you to create songs with 2 audio tracks, where each one is up to one minute. With the Multi-Audio 1/8 accessory (US$19), you can create songs with up to eight 16/24-bit audio tracks of unlimited length. Other accessories allow you to create songs with more audio tracks. 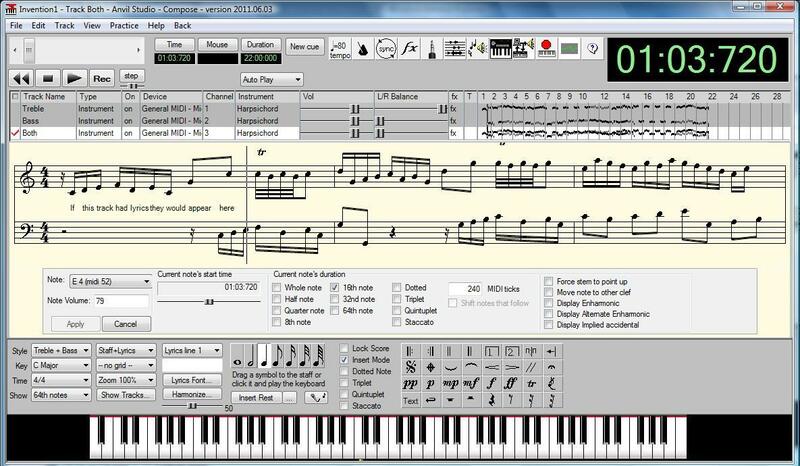 The free version supports an unlimited number of MIDI tracks. Posted by The third gender on Tue, 10/25/2011 - 20:24. Aw, man! That's such a bummer! Posted by nosreP on Sat, 07/23/2011 - 02:07. I guess you could record the WAV with anvil and turn it into an audio track on a new MIDI. I never tried it, but it could be a solution. Be aware, that the editor of this site stated that free users can only have one audio track, and they have to buy anvil to add multiple audio tracks. Posted by The third gender on Mon, 07/25/2011 - 18:50. I was able to have 2 audio tracks. What version are you talking about? Posted by Anonymous on Tue, 07/19/2011 - 01:11. I don't think so. You could record the wav with anvil studio and turn it into a midi. But i don't exactly expect this to be perfect. Posted by Anonymous on Thu, 07/07/2011 - 19:07. This is bad software. NEVER download this! Posted by Omega 3 on Fri, 07/08/2011 - 19:11. Tell me about it! I load the song, and Anvil Studio changes the song before I do! In a bad way! This happens with every file I load onto this software! All the notes start playing off-key! It's not even a song anymore! I have to delete the song because Anvil Studio ruined it!!!!!!!!!!!!!!!!!! All I wanted to do was add a midi control change to some of my songs. I didn't have a device in my home, so I had to do it on my computer. I searched the web for software that was able to add midi control changes. Barely any of them did the trick. When I saw this software, I couldn't hesitate to download it. When I saw what this software did to the songs I had, I was furious. I searched the web again to find SOMETHING ELSE that was able to add midi control changes. All of the pages I read said the exact same things: "Download Anvil Studio." "Anvil Studio is great software." My eyes were bright red at this point. Can't these people understand that I don't want to download this?! I already tried it, and it throws the notes off-key! Now I can't add the midi control change i wanted to add because everyone recommends Anvil Studio!!!! Well, guess what. I HATE ANVIL STUDIO!!!!!!!! ANVIL STUDIO IS HORRIBLE SOFTWARE!!!!! Posted by Ramesh kundal on Wed, 10/05/2011 - 15:48. Posted by Omega 3 on Thu, 10/27/2011 - 22:47. I don't do karaoke midis! Posted by I eat badgers on Thu, 07/14/2011 - 00:42. I don't care what you say. Who does? Even if it doesn't work, it's my only option! This is probably better at making MIDIs than editing them. I'm downloading it anyway! You can't stop me! Posted by I eat badgers on Tue, 10/25/2011 - 20:28. Posted by I lost the lamp on Sun, 07/10/2011 - 19:51. I think you're talking about the new version. I had the same problem. It messed up the notes and replacing the messed up notes didn't work. However, just like you, I don't have a home midi console, or whatever it's called. I had to use the computer, and more specifically, Anvil Studio. I started using the older version (they said it was a year old and recommended I get the newer version. What the heck I don't want the new version it messed up my songs) and it turns out that the older version doesn't mess up your songs. You are right about how Anvil Studio messes up songs, but did you try the old version? It worked much better than the new one. Posted by Omega 3 on Tue, 07/12/2011 - 15:02. OMG Really? Give me the link! Posted by I lost the lamp on Fri, 07/15/2011 - 19:16. Find it yourself! It's so easy to find it! Just search it up! You're the one who made the big rant about Anvil! Posted by Omega 3 on Sat, 07/16/2011 - 20:08. Alright! Fine, I'll do it myself! You don't have to be so rude! I had to do an essay on this, okay? And I learned that YOU SHOULDN'T act like THIS!!! Posted by AnvilStudio on Mon, 09/19/2011 - 18:59. We are more than happy to fix them, typically getting you a new release within 48 hours. The transition from version 2009 to version 2011 was major, and the first few releases did have some problems. o Please email us a copy of the song file before the changes, and a copy of the song file after the changes. o If you don't like what has happened to the song file, don't save it, or save it to a different file. Posted by Omega 3 on Tue, 10/25/2011 - 20:38. The problem happens AFTER I save it. Posted by Support at Willow Software on Tue, 10/25/2011 - 21:24. If you can give us any clue, we'll be happy to fix it. Even if you can just email us the song file AFTER it has been saved in a way you didn't like, along with a general description of what it changed that you didn't like. Posted by Omega 3 on Sun, 11/13/2011 - 18:01.
can i put a post here with download links to the midis? Posted by Support@AnvilStudio.com on Sun, 11/13/2011 - 18:05. Posted by Omega 3 on Fri, 11/18/2011 - 00:09. Posted by Omega 3 on Fri, 11/18/2011 - 00:44. Anvil Studio works just fine for me. Posted by Jason on Wed, 07/13/2011 - 11:42. As the editor on this site I don't usually get involved in these debates, however, I run Anvil on both XP and Vista and I haven't had any problems with the latest version. Posted by Omega 3 on Thu, 07/14/2011 - 00:44. I never paid for Anvil, which is maybe the reason it doesn't work. Posted by Anonymous on Mon, 11/08/2010 - 11:24. I have a recording that has 3 or 4 voices on it. They sound all computerized, and i was wondering if anybody knows how i can single them out to understand them better. Posted by Hans on Fri, 10/29/2010 - 05:06. I am looking for a program which can play one midi track en record others at the same time. can I do that with Anvil?